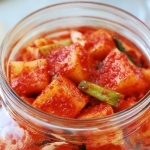 If you ask me which is the easiest kimchi you can try to make this summer, I’d say this cucumber kimchi (oi kimchi, 오이김치)! It’s summer, and we all should be eating more cucumbers. This recipe is super easy! Simply cut up the cucumbers, salt briefly, and then mix with the seasoning! 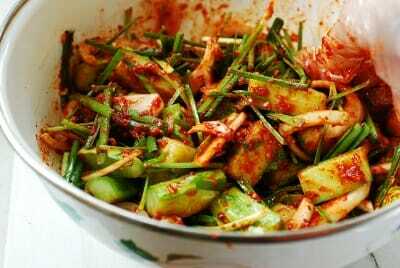 As such, it’s an excellent alternative to the stuffed cucumber kimchi, oi sobagi (오이 소박이), if you don’t want to bother stuffing the cucumbers. 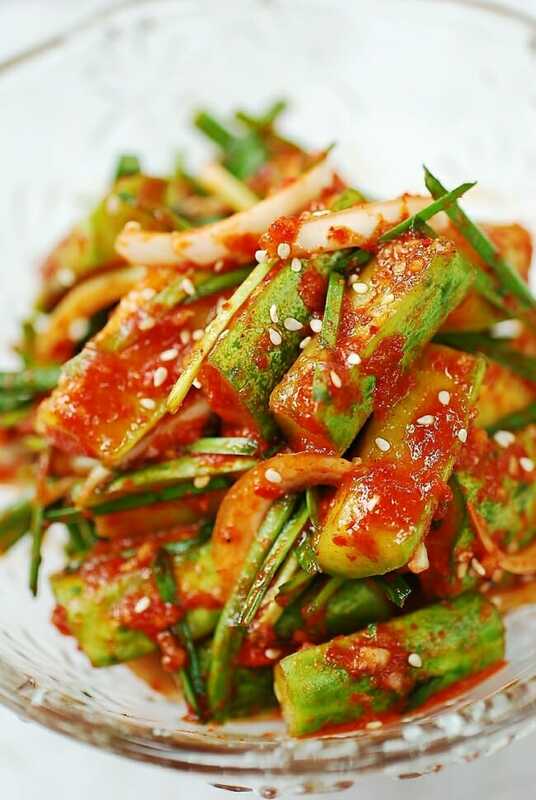 Because the cucumbers are cut similar to cubes, this cucumber kimchi is also called oi kkakdugi (오이깍두기), named after cubed radish kimchi — kkakdugi. I originally posted this recipe in August 2011. This post is a long overdue update with new photos, more information, and an improved recipe. 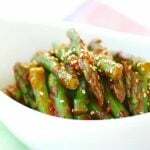 As mentioned in the stuffed cucumber kimchi recipe, use Korean cucumbers if available. Otherwise, use a thin-skinned variety with crisp flesh and small seeds such as Kirby, Persian, Japanese, or English cucumbers. If you have a choice, select cucumbers that are firm and slender. Thicker cucumbers tend to have more seeds and softer flesh. 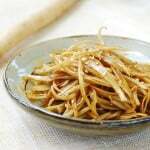 In this update, I also used Korean garlic chives (buchu, 부추), which is commonly added to oi kimchi in Korea. It’s easier now to find garlic chives around here, and summer garlic chives are tender and delicious. You can leave them out if you can’t find them. Simply use some scallions instead. A little bit of julienned carrot or red pepper will give the kimchi a nice pop of color. 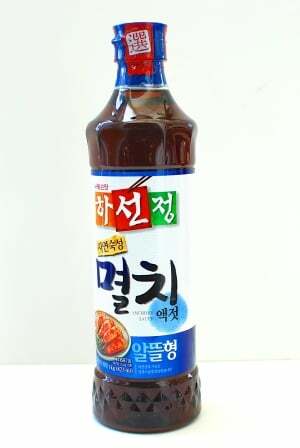 Because this is kimchi, unlike oi muchim, I use salted shrimp (saeujeot/saewujeot, 새우젓) and fish sauce (myeolchiaekjeot, 멸치액젓). The ratio of these two ingredients is always a matter of preference among Korean cooks. 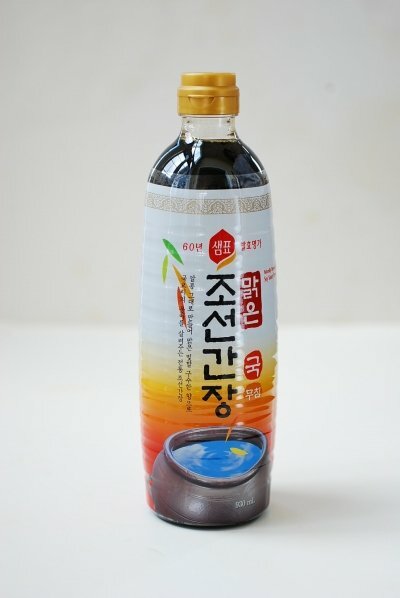 In general, more salted shrimp is used than fish sauce in summer kimchi for a lighter taste, but it’s really up to you! 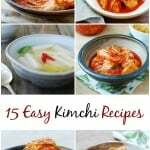 How to make cucumber kimchi vegan? This is actually a question for all kimchi types. There are various ways to make vegan kimchi depending on kimchi types and personal preference. 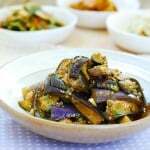 For this cucumber kimchi, use Korean soup soy sauce (gukganjang, 국간장) as a substitute for salted shrimp and/or fish sauce. Use an equal amount and supplement with salt as necessary, or simply use salt to season the cucumbers. How long will this kimchi stay good? You can eat this kimchi on the same day you make it. However, it will get better over a few days. If you like it ripe, leave it out at room temperature overnight to expedite the fermentation process. Then, refrigerate. It will be good for a week or two, depending on the salt level. Super easy kimchi made with cucumbers! Crisp, crunchy, and delicious! 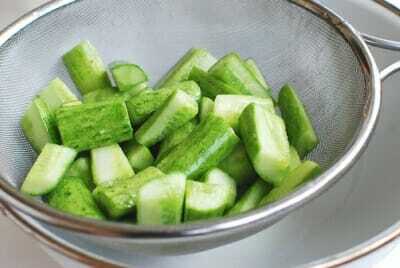 Cut the cucumbers crosswise into about 1-1/2 inch-long pieces. Quarter each piece lengthwise. 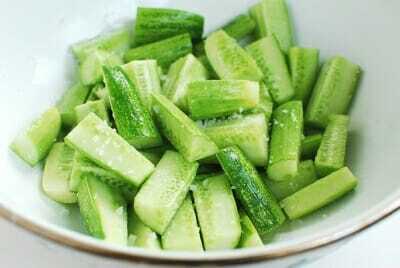 Sprinkle the salt evenly all over the cucumber pieces. Let them sit for about 30 minutes. Drain the cucumbers well in a strainer to remove any water released. Do not rinse the cucumbers. 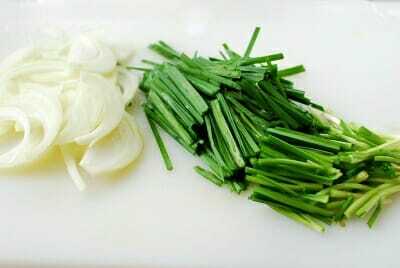 Cut the garlic chives into 1-1/2 inch long pieces. Thinly slice the onions. Add the onions and garlic chives along with all the remaining ingredients to the salted cucumbers. Toss everything until the cucumbers are well coated with the seasoning. The cucumbers will look dry at this point, but will release moisture as they absorb the seasonings. You can start eating this kimchi on the same day. If you like it ripe, leave it out at room temperature for a few hours to overnight to expedite the fermentation process. Then, refrigerate. Congratulations on your anniversary! I enjoy your blog very much, and check it every day for updates 🙂 Especially love your step by step photos! Keep up the good work! Thank you, Anonymous! Your kind words mean a lot to me. You deserve all these recognitions! 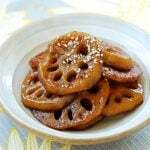 The blog is full of interesting dishes and articles. I love eating kimchi. So I am saving this recipe. Congrats on completion two years of blogging successfully!! Stephanie – Thank you! I hope to continue to improve. purabi naha – Let me know how it turns out for you. Thanks for the kind words! Congrats on all your milestones Hyosun 🙂 I wish you many more to come! Thank you, Denise, for all your support from the very beginning! Another great recipe! I just made this for my family . . we’re having it at dinner tonight. I never have to wonder how your recipes will taste . . always good! It takes the stress out of trying to make a delicious dinner for my family! Thanks for blogging! Oh so nice of you to say all that, Sophia. Thank you! It means a lot to me. I hope you and your family have a wonderful dinner with oi kimchi. Congrats, love your blog! Do you think you could do a post on sundubu jjigae sometime? I will be trying this recipe, I have never met you but have heard some great things from Michelle. Anonymous – Thanks! Sundubu jjigae will be posted soon. Stay tuned! Tina – I have heard great things about you too. Michelle loves you. It would be nice to meet you one day. Sorry about the late reply, but I just came back from a trip and was sick for a couple of days upon return. Michelle told me you made this dish. How did it turn out for you? I enjoyed reading your first post. My first post is talking to myself and no recipe. LOL. Congratulations on your 2 year anniversary!! I also started my blog for my two kids hoping that they will know how to cook what they’ve been eating (but I still got time since they are 5 and 3). It’s so true that I didn’t think it was this time consuming to keep a blog haha. But I’m so happy that I met a lot of friends on the way including you. 🙂 I saw your Babble and I just voted for you! =) I’m looking forward to reading more of your delicious recipes! Every time I read your blog, I get this feeling of familiarity and warmth! Thanks for all the thought and care you put into your posts. Coincidentally, I just made oi kimchi with my mom over Labor Day weekend. It has meant a lot to learn how to prepare Korean food from her, little by little. It’s these passed-down skills/knowledge that I worry will become a lost practice over time. Nami – Your blog is amazing. I admire your talents with each of your posts. Thanks for the vote! Sarah – Thanks for the good words. That’s nice you cook with your mom and learn from her. I am sure you will do the same thing with your own children one day. We just need more people like you out there to continue the tradition. HI Hyosun! Congratulations on your 2nd blogaversary and many accomplishments! 🙂 I enjoy your blog and the foods you post quite a bit. 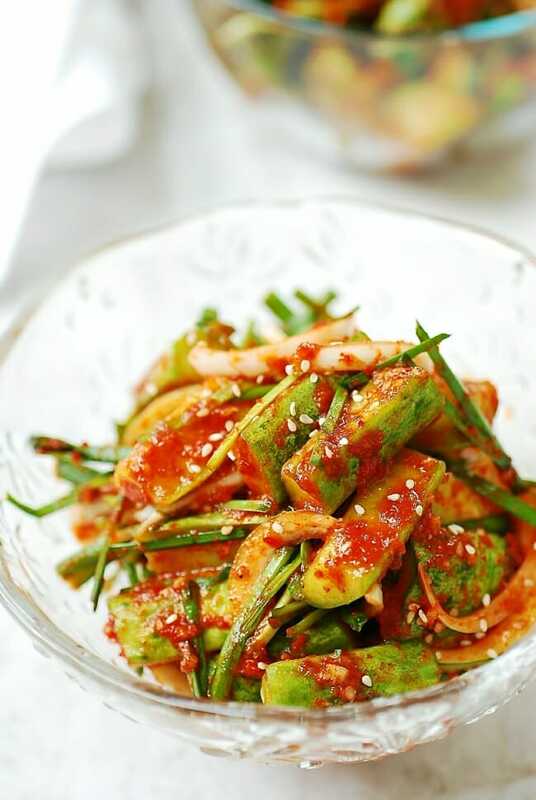 Korean cucumber pickles are one of my favorite things to eat. Of course, like many Korean foods I enjoy, they have mostly come from the Korean supermarket or restaurant, sadly. I am adding this to my “to cook list”. As you can imagine, that list grows each month. Judy – Thank you so much! You’ve been supportive all along since the beginning. In fact, you were the very first few people signed up to follow my blog. It’s been so great to get to know you better since then. I always enjoy your blog, learning Japanese food and seeing Babe E growing up. 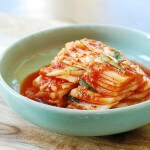 Hyosun, I have almost forgotten to say I have made and posted your kimchi! 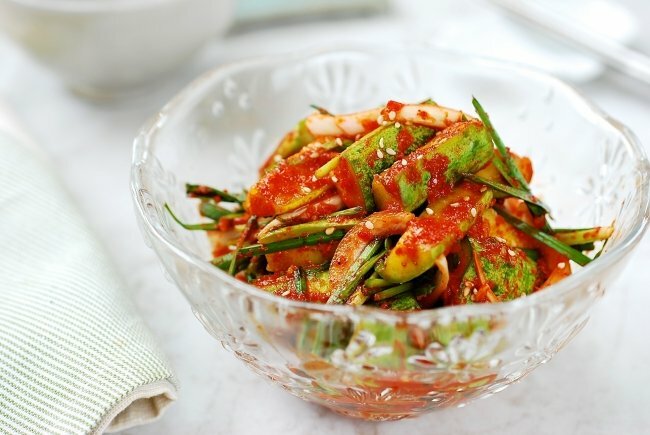 In spite of the Winter season, the cucumber kimchi is extraordinary! Until now it’s my favourite kimchi! Thank you once more for the perfect, easy recipe! Thank you, Sissi! Can’t wait to see it. Coming right over. Hi! I just found your blog a year later and I couldn’t stop looking through all the recipes! Fantastic pictures, everything looks delicious, and I love the way you have laid your blog out. I can’t wait to try some of these dishes! i am a terrible cook but still want to try some of the “easier” more simple recipes. 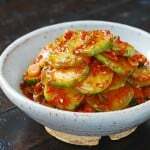 Cucumber kimchi is one of my favourites and i’ve heard it is extremely difficult to make but this recipe makes it look easy! Thanks! Thank you, Michelle! You’re right – this dish is very easy. Hope you try it soon. Thank you! I lost my mom 6 years ago and I only knew how to make a few dishes. Reading your recipies brought back memories of my mom cooking! Thank you I can’t wait to start maiking some dishes like my mother!! I know It’s that good. Thank you so much for coming by! Thanks for all the recipes they are wonderful. Family was amazed at my skills. Thank you, Michael! It’s the support from the readers like you that keeps me going. Happy Korean cooking! Aww thank you, Milton! I’m glad you’ve found me as well. I look forward to hearing about your Korean cooking. Cheers! 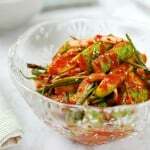 Just made some cucumber kimchi with your recipe. Can’t wait to try! Thank you so much. Hope it turned out well. Enjoy! Congratulations on your blog’s anniversary. Oh this is an old post, but thanks anyway! Hope you can find the ingredients! I just wanted to let you know that I made this oi kimchi today (my very first kimchi-making attempt) and it turned out excellently! (I omitted the onion, though.) My mother loved it so much, she had a second helping of it. Apparently, I’ll make this kimchi quite often in the future. So, thank you very much for this amazing and simple recipe! My great pleasure! So happy to hear about another happy mom! Congratulation for your second anniversary!!! Thank you for posting all the recipes. You are my life saver. Yours is very easy understand and follow. Thanks again!!! Oh this was a old post, but thank you anyway! Actually the 7th anniversary is coming up in August. I just wanted to say thank you for your efforts in creating this site. 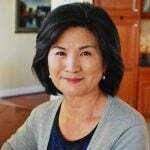 I have been cooking Korean food for over 10 years now and look at your recipes for new fresh inspiration and tips to constantly improve my cooking. Thank you again! That’s great to hear, Ryan! Thanks for leaving me a note. It really means a lot to me. Cheers! This turned out really well. I used two tsps soy sauce and 1 tsp vegan broth for the fish sauce to make it free of animal products. I let it ferment about 4 hours at room temperature to get some good bacteria going. I love Korean food but usually ate them at a Korean restaurant. Your blog definitely encourage me to try to cook at home. 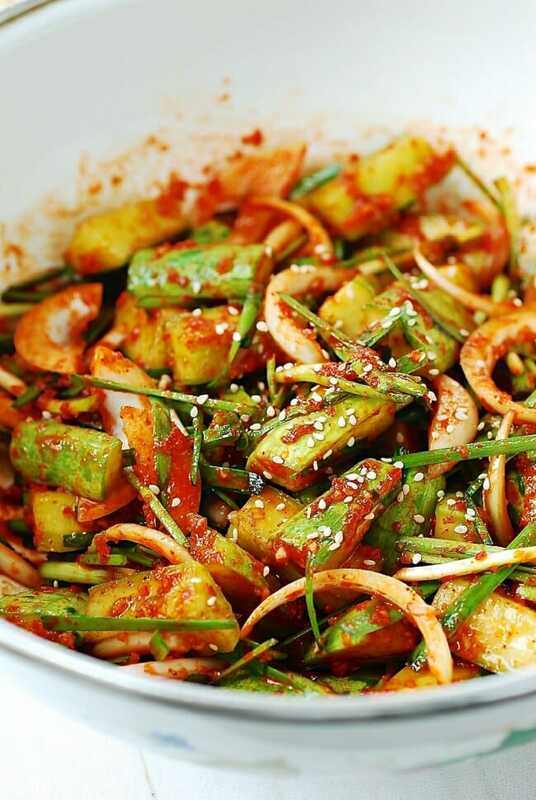 just made your cucumber kimchi? it turns out pretty good.